Buying crypto, including Steem, keeps getting easier as more options become available. Cryptovoucher.io uses a very simple system that includes purchasing a voucher via various online and offline payment methods, as well as crypto and gift cards. 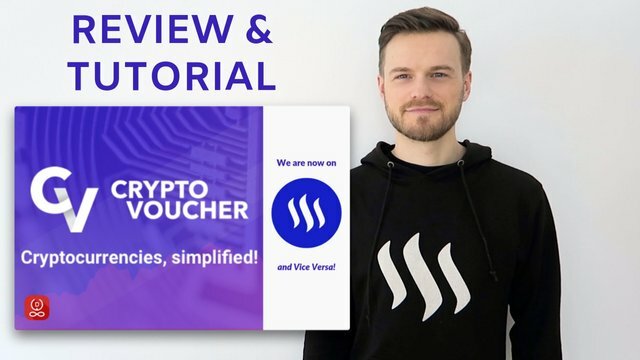 In todays video I give you an honest review of my first experience using this service and a step by step tutorial in this @cryptovoucher review blog post. Step 2: Sign up to the website (see video for details), purchase the desired cryptocurrency either directly on the website (not recommended) or use one of the available online distributors (recommended). Make sure you purchase a voucher for your desired cryptocurrency or purchase a generic voucher that can be exchanged for any cryptocurrency you choose. See above video for details. Step 3: Redeem your cryptovoucher, click on the ‘REDEEM’ button at the top right corner of the website and enter your cryptovoucher-code. You need to enter the address of your cryptocurrency-wallet to receive the cryptocurrency. 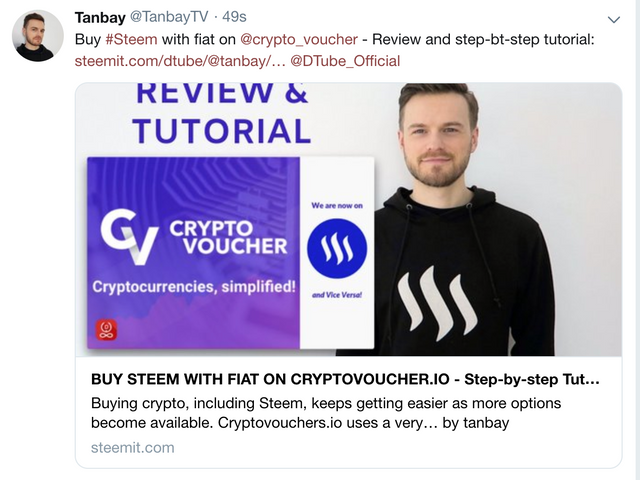 If you chose Steem, your wallet address is your username WITHOUT the ‘@‘, so for example my wallet address is tanbay. You also need to fill out the ‘memo’ field, I used ‘cryptovoucher’ as a memo. Step 4: Click on ‘I understand & agree. Redeem now.’ After that you should see a green screen that says ‘successful transaction’, watch my tutorial video for more details. DISCLAIMER: This is not financial advice and I am not a financial advisor. This was such a great tutorial Tanbay. I had issues with the payment option myself but I will try again with the distributor option in future. Cheers. They definitely seem to make things extremely easy for everyone to make crypto purchases no matter what complications they may face! You have great content, @tanbay. Very well put together. Glad to see you continually adding value to the blockchain community here on Steem and also outside of this ecosystem. Keep up the solid work. That is EXACTLY how I experienced it. And then the 'buy with credit card' option appears a day later! It was a bit complex, but I've just set up a BEOS account, and trust me this is simple in comparison. It's all relative. It's just.... those withdrawal fees.. OUCH. Wow I totally failed to check about the withdrawal fee! I'm going to link to your review and edit my post right now for visibility! Thanks for mentioning that!